While the tournament took place the weather conditions shifted from dry to wet while Tanaka beat out his fellow team mate Kumakubo to advance to the finals. 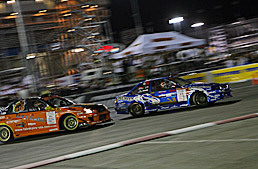 Matched up against the 3 time Irwindale winner Kazama, the two battled it out on the famous Irwindale embankment. The first run determined Kazama to have more intensity however Tanaka had closed in on him at the hairpin turn. With the score even, Kazama ends up spinning out on the second run after attempting to close in on Tanaka. 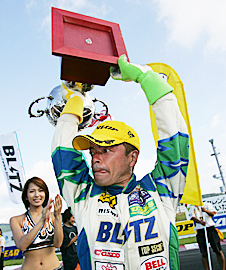 Tanaka claims his second victory in the D1 series after his victory in round 3 of the 2003 series where the battle took place in heavy snow. Tanaka’s opponent in the best 8 round was Suenaga. Although Suenaga had closed in on Tanaka on the first run, his machine did not perform up to par in the rain. Swerving straight on the second run at the embankment, Suenaga performed numerous mistakes on the infield as well, handing the win to Tanaka. Tanaka was matched up against his team mate Kumakubo in the semi-finals. 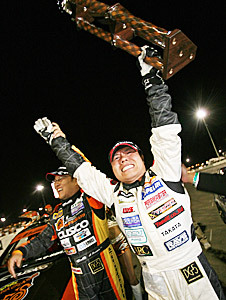 Since Kumakubo’s championship title had been determined at this point due to Nomuken’s defeat in the race, the two Team Orange contenders battled it out with tears in their eyes. This emotional battle ended up with Tanaka taking the win for advancement. Nomuken battles Kazama in the semi-finals. With a tie for the first run, Nomuken loses this match by lacking intensity and vehicle speed in the infield. This result determined Kumakubo’s championship title. 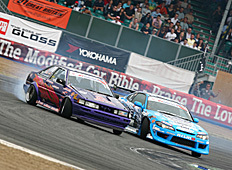 Piloting a turbo AE86, Darren McNamara from the D1 UK series battles Daigo Saito in the best 16 round. 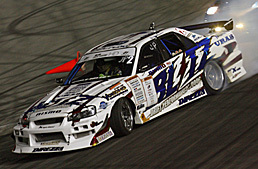 Darren drove flawlessly, taking down Saito to advance to the best 8. 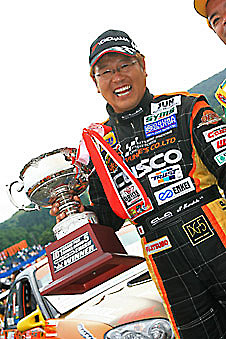 Although Nomuken couldn’t grab the 2006 series championship title, he went home with the title of the world all-star champ. Since the weather turned up to be dry for the all-star match, Nomuken was given the opportunity to display his smoky style drifting in full force. Gaining a perfect score in the solo run portion, he battled the quick Suenaga in the final stage. The first run ended up a tie after Nomuken closed in on Suenaga, but Suenaga gets washed outwards on the second run at the hairpin turn where he attempted to get closer. Nomuken’s win was determined at this point. Nomuken faced Darren McNamara in the best 8. Nomuken revealed that he found a line that increased his speed at the exit of the embankment, closing the gap between him and Darren at the hairpin. The second run was a tie, handing the win to Nomuken. 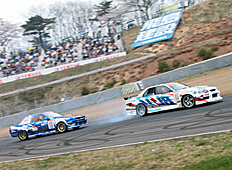 Nomura was matched up against Ueo in the AE86 in the semi-finals. Nomuken gets washed outwards after displaying an intense smoky drift at the embankment. Although Ueo slides outward of the line on the second run, Nomuken still took the win. Gittin defeated by the Malaysian AE86 Rhys Millen’s new machine! 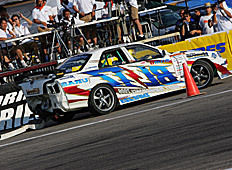 Tengku Djan, a Malaysian contender was matched up against last year’s exhibition winner Vaughn Gittin Jr at the best 16. Djan took advantage of the lightness of his AE86 to make up for the handicap at the embankment, closing in on Gittin at the hairpin turn. Djan advances to the best 8. The US’s top drifter Rhys Millen premiered his new machine, the Pontiac Solstice. The machine was only 70% complete, putting up a great fright against Imamura. The machine proved to be smooth and nimble, warning the rest of the contenders what they will be up against next season. 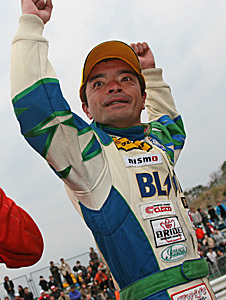 Managing to obtain perfect scores consecutively in his solo runs, Kawabata climbed his way to the top ranks. 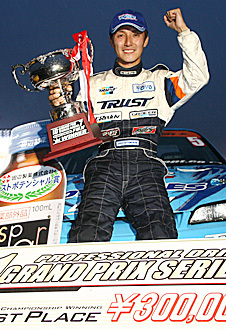 Managing to obtain perfect scores consecutively in his solo runs, Kawabata climbed his way to the top ranks. Steadily defeating the contenders that were matched up against him in the tsuiso rounds, the track conditions shifted to a rainy state in the semi finals. After knocking out Yoshioka, the two men left in this race were Kawabata and Tezuka. Kawabata gained the advantage on the first run after Tezuka failed to keep up at the slippery hairpin bend. Kawabata kept right on Tezuka's rear for the following run, taking his first win of the season. The best 8 match was against Komoro in the AE86. Komoro kept up well and even managed to close in on Kawabata. However, his machine became off track during the chase, giving the advantage to his opponent. The second run ends up in a tie, and Kawabata receives the win as the advantage gained on the first run. The track conditions had shifted from dry to wet at this stage. Kawabata and Yoshioka both end up spinning out on the first run. Yoshioka spins out again on the second run, handing the win to Kawabata. A spin decides the battle of the orange Tezuka overpowers some of the best contenders! Kumakubo managed to be matched up against his team mate Tanaka in the best 16 match. Although they displayed some spectacular tsuiso racing, Tanaka ends up nudging Kumakubo sending both of the cars into a spin. Therefore the judges were in favor for Kumakubo advancing to the next stage. Tezuka remained to be on fire in both the solo and tsuiso runs. Defeating Nomuken, Kazama in the best 8, and Kumakubo in the semi finals, he resulted in defeating the top ranked contenders consecutively. He moves on to the finals for the first time this year. they would mess up. So I would win everytime..."
Without any sense of gaudiness, Hiraoka in the WISE S15 displays his perfect speed, smoothness, and lines. The opponents he faced had all performed mistakes as he continuously maintained his perfect runs. Matched up against Nomuken for the final battle, Hiraoka kept his composure until the very end where Nomuken had swerved straight, going into a half spin stance. The well deserved win was handed to Hiraoka. In the Best 8 round, Hiraoka faces Kawabata. The first run, Hiraoka leads and Kawabata veers in too forward, forcing his machine to swerve back. Kawabata had won the next run, but his mistake earlier costs him the match. Hiraoka faced Hibino in the semi-finals. On the first shot, Hibino swerves back straight at the S turn after the judging stands. Hiraoka takes the advantage into the second run and wins this battle since Hibino’s first run mistake was too obvious. Kumakubo claimed that he was struggling to grasp the techniques of this track, as he failed to make it past the solo round. He had grasped the techniques of this track however, lacked speed. Kumakubo drops down in the overall point ranking. Kazama had faced Hiraoka in the best 16 match where he exhibited great velocity at times leaving Hiraoka behind. 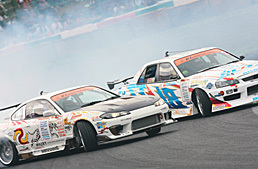 Kazama chased Hiraoka right behind the S15’s tail. However mistaken by Hiraoka’s moves, Kazama ends up spinning. Nomuken now ranks above the mighty Kazama in the point series. where I never thought I'd win at"
Although Ebisu is his home track, Kumakubo is known to do very poorly here especially at the south course. However, when the tournament reaches the tsuiso round, Kumakubo takes down Mizuhata, Tanaka, and Kawabata. Kumakubo won against Kawabata by default after Kawabata's machine experienced engine trouble and failed to proceed. Nomuken was his final opponent, rising to the finals with a broken 2nd gear. The battle was a close call, but Kumakubo managed to stick his nose inside Nomuken's angle at the first corner, securing his win. Mizuhata, who scored a perfect 100 points during his solo run was matched up against Kumakubo in the best 16. Kumakubo claimed that he has been carefully studying Mizuhata's moves and won the battle by moving in on his opponent. The rest was history after he managed to follow the lead car very closely, pushing him up to best 8. The best 8 match was against his team mate Tanaka. On the first run, Tanaka stuck to Kumakubo's side sliding their way across the track. However, Tanaka could not keep his steering countered at the 3rd turn. The second run being a tie, Kumakubo won this battle. With smoothness and perfection, Hiraoka proceeded to the semi finals after defeating M. Suenaga. At the end, Hiraoka ended up understeering while experiencing engine difficulties being defeated by Nomuken. However, he managed to place 3rd. Kawabata vs. Tezuka match during the best 8 tournament consisted of both contenders crashing and spinning. Unable to determine the victor after 4 sudden death rounds, Tezuka made a mistake handing the win to Kawabata. 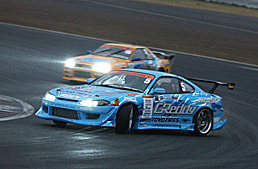 D1 Grand Prix Rd.5 is available on JDM Option DVD Volume 31! "I wanted to win here in Kyushu really really bad." 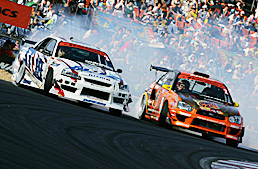 Nomuken used his super long drift techniques sliding into the entry turn at extreme speeds to defeat the other two Kyushu natives Suenaga and Ueo. Kumakubo had defeated the great Kazama and the quick Tezuka using his quick switchback technique to advance to the finals. In the final battle against the Blitz driver, he was surprised to encounter Nomura's god-like entry speed. Kumakubo makes a vital mistake and the win was handed to Nomura. Nomuken was matched up against the Kagoshima Kyushu native Suenaga in the best 8. Both displayed a tie game on the first run, with Nomura at chase. During Suenaga's chase run, Nomuken displayed a huge drift angle swinging his tail before Suenaga can even react. Suenaga failed to keep up with his opponent's exuberant style. Ueo jumped up to the semi finalist position against Nomura. When Ueo was in the lead position, his left rear tire fell off course, colliding with Nomura's left side. Ueo retired, unable to proceed to the next run, handing the victory to Nomuken. 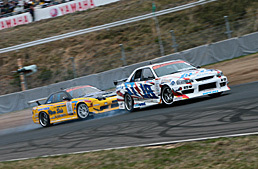 During the Kazama vs. Kumakubo battle in the semi finals, both contenders displayed some intense drifting action. However, both had small mistakes, taking them into sudden death overtime.On the first sudden death run, Kazama's lines became distorted and on the second run Kumakubo managed to keep up behind Kazama's tail. Kumakubo advances to the next stage. Although Yoshioka remained fully confident at this course, he was thoroughly defeated by his foe. After following Kazama who put on a great angle on the first run, Yoshioka ends up colliding. Losing his posture, Kazama ends up advancing to the next battle. 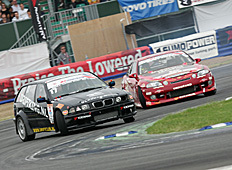 D1 Grand Prix Rd.4 is available on JDM Option DVD Volume 30! "I'm very happy of the outcome because it was this car's very last battle!" Yoshioka is scheduled to pilot a new machine following this US exhibition event. Being paired up against Kumakubo in his alternate Impreza, Yoshioka was deeply pressured from behind in the 1st tsuiso run. 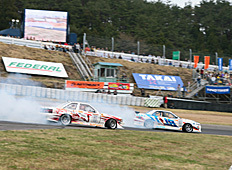 Kumakubo overspeed the turn, coming in contact with Yoshioka's rear forcing the Impreza into a spin. The AE86 maintained its composure, barely sliding past the concrete barrier. Both parties had no mistakes on the 2nd run, handing the win to Yoshioka. In the semi-finals against Tanaka, both drivers performed no mistakes tying up the game. However in the sudden death match, Tanaka failed to keep up with Yoshioka's quick moves and understeers in the 1st turn. Yoshioka was put up against Saito in the best 8 tournament. Both drivers displayed many flaws during the 1st and 2nd run, pushing them into overtime battle. Yoshioka displayed his quick speed during the sudden death tsuiso battle, leaving his opponent in the dust. Ken Nomura suffers a huge crash during the solo run portion of the race. The vehicle was unable to stop at the first turn after attempting to set the fastest entry speed. Nomuken was forced to retire at this point, disabling his involvement in the tsuiso battle. 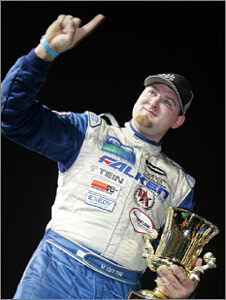 Being the only American contender to make it to the best 8 round, Vaughn Gittin was put up against Komoro. Gittin shoots off course on the second tsuiso run after miscalculating the quick speed of Komoro's hachiroku. "At this particular course, knowing that it's easier to gain the victory while in the lead had paid off big." Kazama had exhibited high-spirited entry speed as well as the ability to drastically reduce his velocity in this race. No matter what machine his opponent was in, he had kept right with them side by side, climbing to the finals. The final battle was Kazama versus Kawabata. Kazama had miraculously kept up with Kawabata's flawless run in the first battle, gaining him the advantage. The second battle, Kawabata ended up cutting in the inside line, producing understeer. Kazama's win was secured at this point. The best 8 match consisted of Kazama and Oka-chan of Yashio Factory. 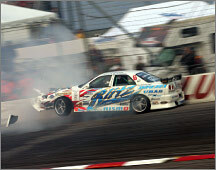 Oka-chan suffered transmission trouble and was unable to keep up with his opponent's great speed and angle. Although Kazama had made an error while in pursuit, he advanced to the semi finals. Matsuda, who had defeated two UK locals, had risen up to the semi finals to battle Kazama. Matsuda made a mistake of taking the outer line in the first run chasing Kazama. Kazama was hot on Matsuda's tail on the second run, exhibiting a near perfect run. McNamara, who is labeled UK's top drifter, was matched up against Matsuda. However, Matsuda was evidently quicker on the turns. 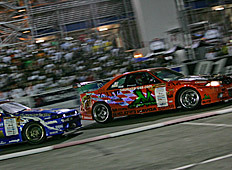 Although Matsuda had several mistakes, he passes up McNamara to take the victory. The difference of speed between Ueno and Vlasblom was immensely obvious. Ueno left Vlasblom in the dust when in lead, however makes a huge mistake while chasing his opponent. Trying to adjust to the sluggish BMW, Ueno stalls to hand the win to Vlasblom. 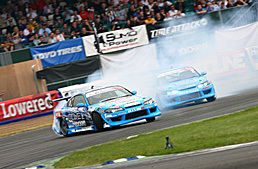 D1 Grand Prix Exhibition in UK is available on JDM Option DVD Volume 29! "I'm doing my best this season to become #1 again." Although Kazama didn't display anything particularly amazing during his solo run, his performance in the tsuiso round was simply astounding. His final opponent was Ueo, who came up to the finals after Kumakubo forfeiting due to engine failure. Kazama's angle was a bit shallow at the 300R on the first run, leaving the advantage to Ueo. Nevertheless Ueo suffered a blown engine after this run, disabling his chances at the second run. With Ueo's forfeit, Kazama rose to the top. Kazama chased Kawabata very closely to the last mark in the best 8 match. Kawabata ended up pushing Kazama with both contenders spinning out in the second run. Because of this Kazama was given the win. The semifinal match was against Sakuma. Sakuma had the higher speed but ended up spinning out on the first run. On the second run, Kazama secured his advancement to the next stage with a conservative and stable driving style. Kumakubo came to battle intending to take the victory. Matched up against Ueo at the best 8 round, he faced some bad luck. With a cracked manifold during practice, his vehicle was unable to produce any power to the ground. The win was handed to Ueo. 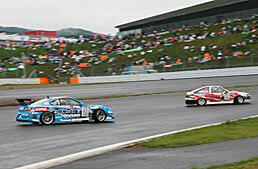 Imamura was matched up against the AE86 driver, Komoro in the best 16. 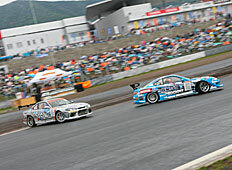 Imamura took the inner line when chasing his opponent, lining up parallel coming out of the turn. This was Imamura's first tsuiso win since switching to the Z.
D1 Grand Prix Rd.3 is available on JDM Option DVD Volume 28! "I drove cautiously not to crash"
Since the practice round, Nomuken exhibited flawless runs after installing the new sequential transmission. His chase runs are often filled with mistakes but this round, he held back 2 car lengths behind his opponent at his own pace. This method proved to be the most effective and it landed him in the finals. Nomuken made a slight error during the first run of the finals, but due to Kuroi's severe mishap on the second run the victory was handed to Nomura. 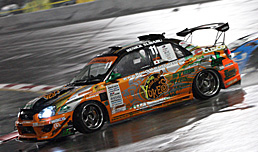 Battling Tokita in the quarter finals Nomuken made a slight mistake during the second run. Regardless, he managed to win after Tokita swerved straight. Nomura was put up against Yoshioka in the semi finals. 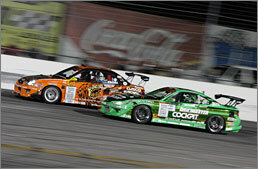 Although Yoshioka's speed was higher at the Irwindale track, this time Nomura was above his opponent. 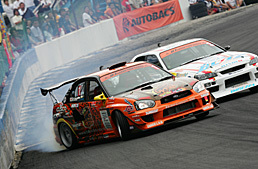 Naoto Suenaga had joined Team Orange with his new GC Impreza and was matched up against his team mate Kumakubo. Kumakubo won due to Suenaga's mistake during the first run. Despite his engine beginning to lose compression, Suenaga had managed to make it to the semi finals. But there, Kuroi with the powerful Onevia equipped RB sped off to take the win. D1 Grand Prix Rd.2 is available on JDM Option DVD Volume 27! "I started the season with a great head start! I will try and keep up a winning streak!" After scoring high points during the solo runs, Kazama was on fire battling Kuroi and Nomuken during the chase runs. 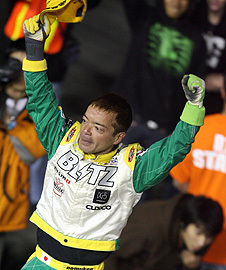 Beating Tanaka in the semi finals, he proceeded to the finals against the tsuiso master Kumakubo, who out ran the US driver Hubinette. On the first run Kumakubo ended up spinning out, resulting in the 3rd consecutive season opener victory for the great Kazama. Although Nomuken closed in on Kazama at the hairpin during the best 8 competition, Kazama stuck with his opponent from the bank all the way to the end to gain this victory. During the semi finals, Tanaka had panicked and entered the turn with too much speed. This resulted in Tanaka sliding outside the line to hand the win over to Kazama. 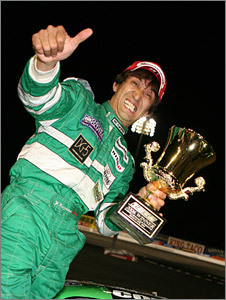 The Top American This Day was Sam Hubinette The Young Shuichi Yoshioka Crashes! 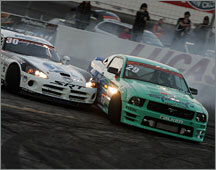 Hubinette in the Dodge Viper was matched up against Gittin in the Ford Mustang for a heavyweight battle. Gittin claimed "Although I believe I had no big mistakes, it was enjoyable to battle Sam in a high speed rough fight". Although S.Yoshioka performed brilliantly on the solo round, he crashes into Sakuma during the chase round. Feeling the pressure, he was disqualified after pushing his opponent. Later he stated ÏI will not make the same mistake next time. The D1 Grand Prix Rd. 1 is available on JDM Option DVD Volume 25! The V8 Machine Defeats the Top Japanese Contenders, Kazama and Imamura! 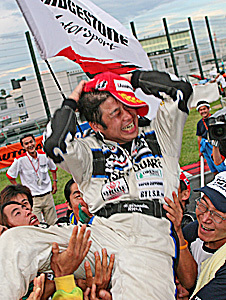 Tatsuya Sakuma of APP Racing was Gittin's final opponent. Both teams suffered engine problems but after two sudden death matches, the Ford Mustang defeated the silver S15. Gittin's Mustang is powered by a supercharged V8 setup cranking out over 500 horses. Gittin was matched up against the 2005 champion, Kazama at the 1st stage of the tsuiso tournament. 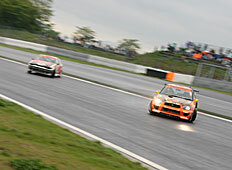 Here, Kazama was expected to win, but after producing understeer at the 2nd turn, Gittin took the lead. 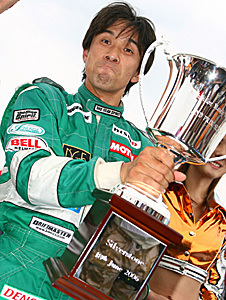 The next opponent was the 2003 champion, Imamura. Going into sudden death, Imamura ends up spinning on the 2nd run. Gittin barely avoids the RX-7, scuffing his rear bumper sliding past Imamura. Nomuken and the Blitz team displayed flawless runs during the practice session. But at the solo runs, the Skyline had too much speed at the S turn going into a spin, sending it straight to the concrete wall. Unfortunately, with suspension damage, the vehicle was forced to retire. 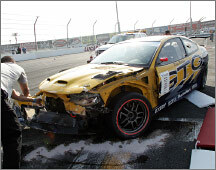 The top American contender Rhys Millen who pilots the Pontiac GTO suffered a crash during practice. Millen regrets not being able to battle his father Rod Millen, who had also entered the race.